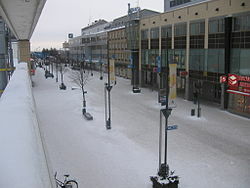 Kouvola is a toun an municipality in sootheastren Finland. It is locatit 134 kilometres (83 mi) northeast o the caipital, Helsinki. The ceety haes a population o 87,168 (31 August 2013) an covers a aurie o 2,883.30 square kilometres (1,113.25 sq mi) o which 325.06 km2 (125.51 sq mi) is watter. The population densitie is 34.07 inhabitants per square kilometre (88.2/sq mi). Kouvola's central location athin Finland's borders an as a border post atween the European Union an Roushie Federation maks it a quite lively toun. The toun oreeginally grew up aroond the junction o the north–sooth an east–wast rail tracks. It wis a major road transport junction an aw. In Januar 2009, the sax municipalities – Kouvola, Kuusankoski, Elimäki, Anjalankoski, Valkeala an Jaala – wur consolidatit, formin the new municipality o Kouvola. Kouvola can nou claim the natural brawness o Valkeala an Jaala as well as the cultural heritage o Elimäki an Anjalankoski as its awn. Kouvola haes assumit the slogan Kymijoen kaupunki (the toun o Kymijoki) an aw, previously uised bi Anjalankoski. ↑ "Kouvolan kaupunki". Website of Kouvola. Retrieved 20 June 2010. This page wis last eeditit on 4 Mairch 2018, at 04:39.